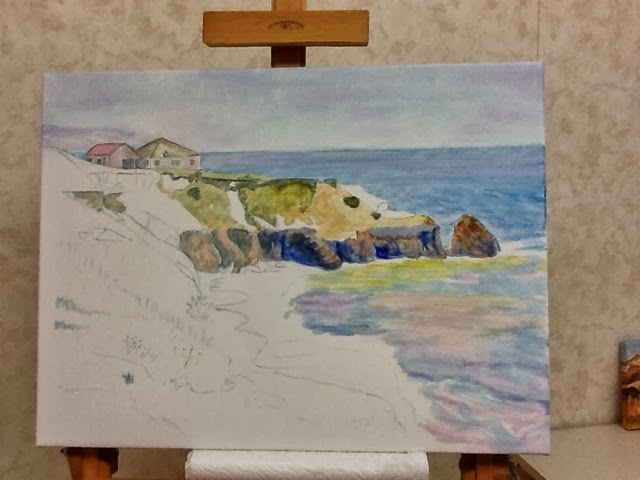 I have started a new painting. It is a seascape, which is a very conventional subject. However, for me it is a new challenge. 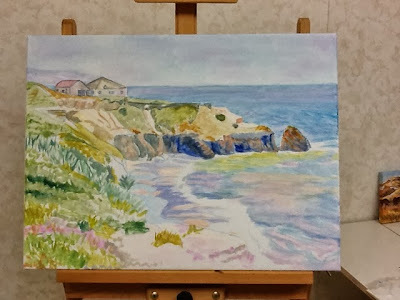 I have never attempted a seascape before. I am working from a couple of photos I took when travelling along the west coast of Portugal two summers ago. This was a particularly beautiful spot, and I have fond memories of it. This is how the canvas looked after I had drawn in the design and begun blocking in the main shapes and colours. I was working with very thin oil paints to block it in, and choosing colours that were quite transparent. The photo above shows how it looked after the next painting session. At this point, I had blocked in most of the sections of the painting, leaving only a few sections of canvas showing through. As you can see, I was still working with very thin paint, and although I attempted to capture the main colour blocks, the values are all wrong. As well, my drawing errors are apparent at this stage. I like the way that I have worked the palette of colours across the whole painting, though. It gives me something interesting to work with as I continue. I also like the transparency of the colours, almost like a watercolour painting. In my next and most recent painting session, I worked on correcting some of the drawing errors, and I started putting in the darker values, especially in the slopes below the houses and the cliffs. At this point, I am not happy with the painting as shown below. It is at the ugly stage. The colours have turned muddy, losing the transparency that I had in the beginning, and my marks are too tentative. Of course, part of the problem is that my attention has been focused on one section, while leaving the pale wash of the ocean and the foreground untouched. Another challenge with this painting is that the darkest values are mostly in the cliffs and the hills which are quite far away. Even the more distant part of the ocean is deeper in value than the near section of waves breaking on the beach. This is counter to the usual rule that things look softer, lighter in value, and less distinct when they are farther away. Even though I am struggling a bit with this painting right now, I am enjoying it. Every painting, at some point becomes a struggle, but usually if I keep going, I work through it and end up with something that might be different than what I envisioned but that more or less works. What I really feel like doing is grabbing my painting knife and slapping paint on. 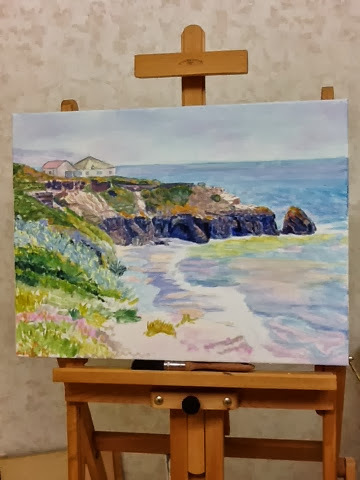 You probably can't tell from the photo, but the bluish and dark green grasses in the mid ground on the left were done with a palette knife. There are lots of articles and books out there on leadership. Inspiring, humorous, or pragmatic and instructive; they come in many forms. Field Wicker-Miurin gave a TED talk a few years ago of the inspirational sort - people from around the world who, through extraordinary dedication and passion, have made a significant difference in their community. She called it Learning from leadership's Missing Manual. It seems that after a number of years in leadership positions, a person is compelled to write his or her own tome to contribute to the leadership literature. However, I have noticed that there is a book missing from the shelves. My missing manual is not Wicker-Miurin's heart warming perspective, but rather one that would dive into the ugly side of leadership. This book would explore leaders' lived daily experience and the parts too embarrassing or sad to acknowledge to one's colleagues or to eager initiates. I have listed below some (roughly sequential) chapter titles that such a book directed to beginning leaders might include. The alternative chapter titles written in brackets after each chapter heading from Leadership: The Ugly Side are the related euphemistic topics more typically found in leadership literature. Looking at the ugly side of the experience of leadership, sometimes it is hard to remember what it is all for. Maybe I should watch Wicker-Miurin's talk again, or go and read another one of those inspirational leadership books. Or maybe I should start writing my contribution to the literature: Leadership: The Ugly Side.